The last item on the review-queue-list on main is "Meta Reviews". Curiously, there's no corresponding link from the review-queue-list on meta back to "Main Reviews", even though that list is much shorter. I suggest adding it for convenience and regularity. tested on Chrome, with Tamper Monkey. Not the answer you're looking for? 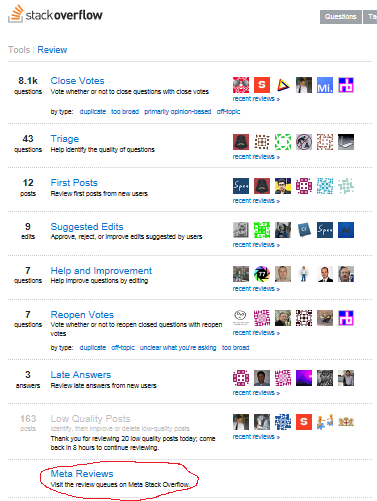 Browse other questions tagged feature-request review design meta . 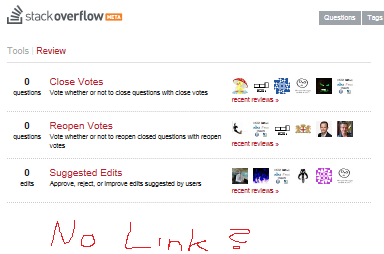 Can there be a more prominent link to the meta sites from the main sites?